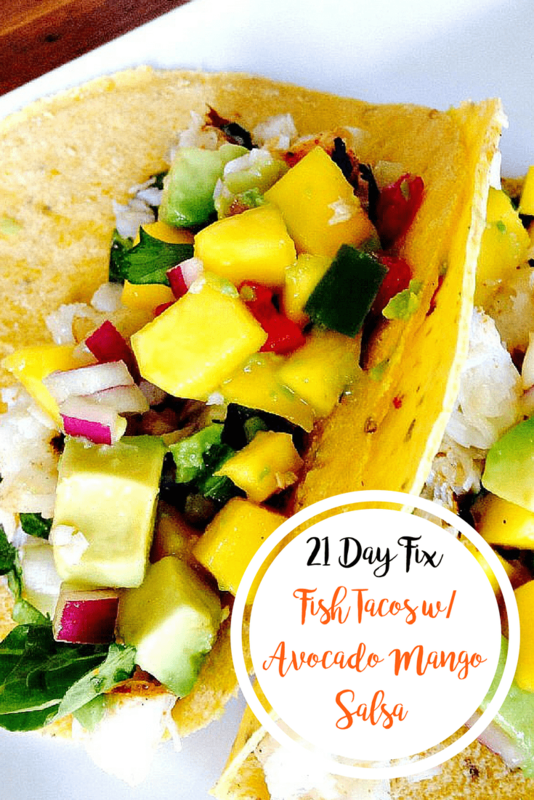 Fish tacos with avocado mango salsa may just become your new favorite 21 Day Fix recipe to celebrate Cinco de Mayo! 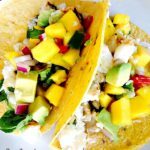 Light, fresh fish and delicious mango salsa with just the right amount of heat, make these fish tacos perfect for any time you get that taco craving! Hmmm…I seem to have misplaced my margarita. But I do have these healthy and delicious Fish Tacos with Avocado Mango Salsa and Cilantro Lime Yogurt sauce to celebrate with. Fresh, simple ingredients with the a resturant quality meal. Who needs to go out, right? Actually…I do. But that’s a different story. 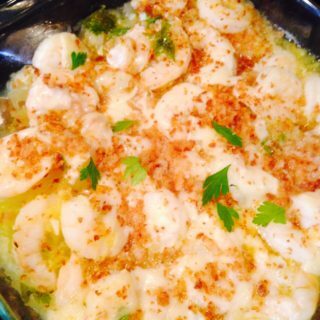 You could make this recipe with any fish you would like, or shrimp for that matter. I used Turbo, which I never heard of, but was highly recommended at Whole Foods. It was awesome – light, buttery, and took on the flavor of the the cilantro lime marinade very well! Try it! 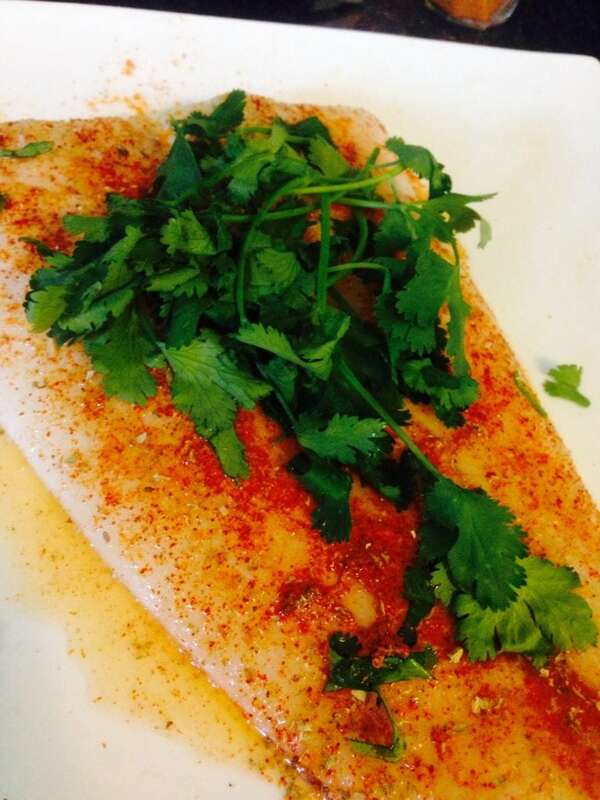 Marinate the fish in taco seasoning, juice from 1 lime and a small bunch of cilantro. Let sit for at least 20 minutes. 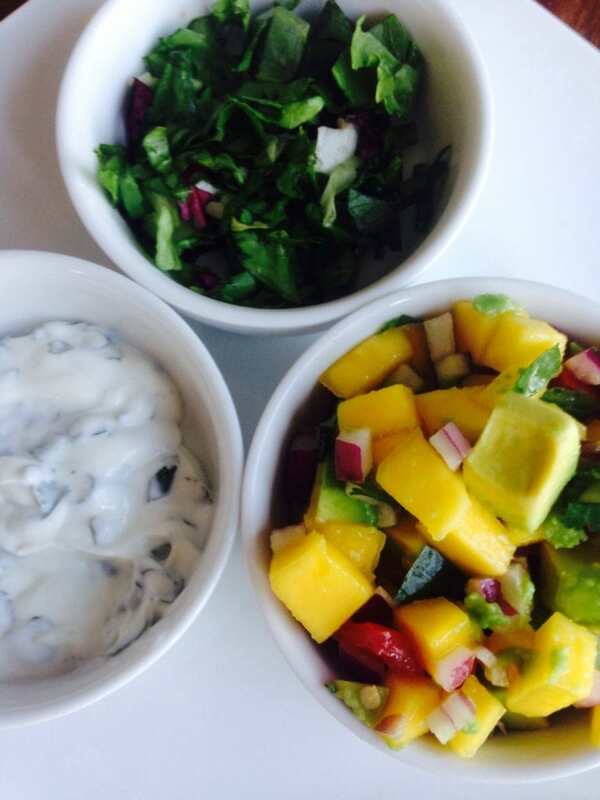 Combine the mango through the diced red onion from the list of ingredients to make the salsa. Add juice from one lime and a tablespoon of chopped cilantro. Next, make the yogurt sauce. Add the juice from the last lime with the Greek yogurt. Add 1-2 tablespoons of diced cilantro and mix well. Grill fish until flaky and white. You could cook this on the stovetop, but I LOVE cooking fish outside. No smell or cleanup!! When the fish is cooked through, lightly spray the corn tortillas with olive oil and place on the top rack of the grill for a minute or so, just until warm and pliable. **If you get distracted by your 5 year old and leave them on too long, they will become tortilla chips. Just a warning! Assemble tacos while tortillas are warm. First, I spread the yogurt sauce, then add the cabbage or lettuce, fish, and top with the mango salsa. You do it your way- it’s cool. Find that margarita, mojito, or magical 4oz of white wine and have your own fiesta! 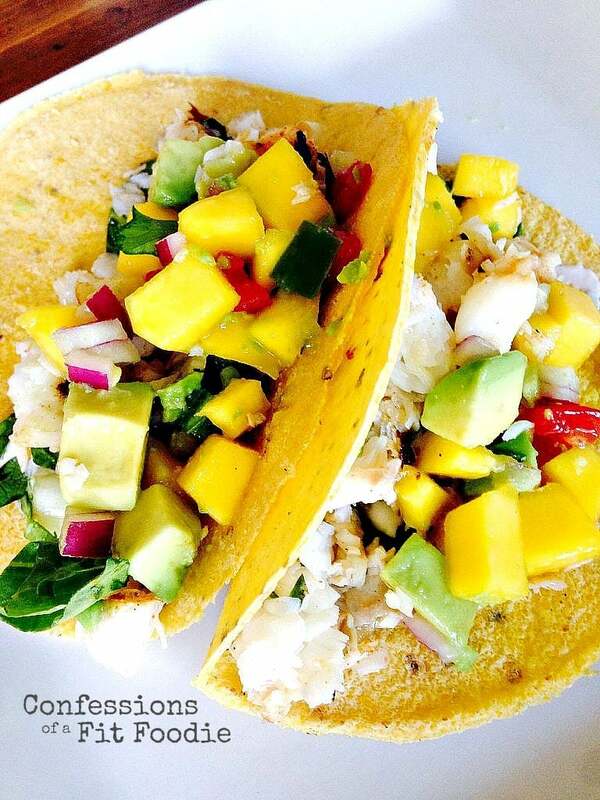 Hubby and I ate Mahi Mahi with the avocado mango salsa on top and the cilantro Greek yogurt. YAY!! We love them, too!! Thanks for the great comment :). My husband and I are obsessed! 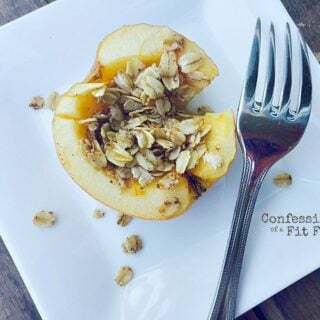 I make these every week..So healthy, fresh and delicious! That’s awesome!! And so easy, right? Thanks for the great feedback!! Is a red not counted for the fish? Love this recipe though. I’ve made it twice now with cod and halibut. Oh my goodness! Yes – thank you! How many tacos are a serving? Neverminddd. Just saw the top!! Made this tonight and loved it. My first attempt at one of your 21 day fit recipes. 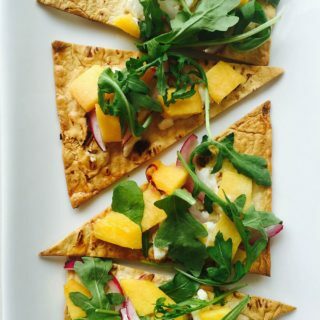 Super yummy and refreshing. I liked that it had a variety of containers in one meal which I struggle at doing on my own. Making your homemade tomato sauce tonight to use to make some pizza tomorrow! I’m so happy to hear, Becky!!! 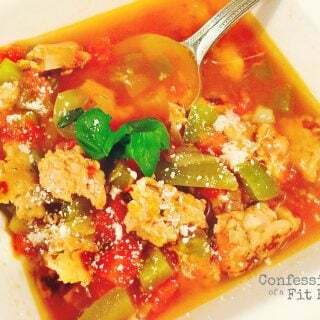 Best of luck to you – are you in our 21 Day Fix Recipes, Tip, and Support group on Facebook? I’m not but I will look for it! Awesome! Let me know if you need help finding us!